Now we'll talk about number sense. 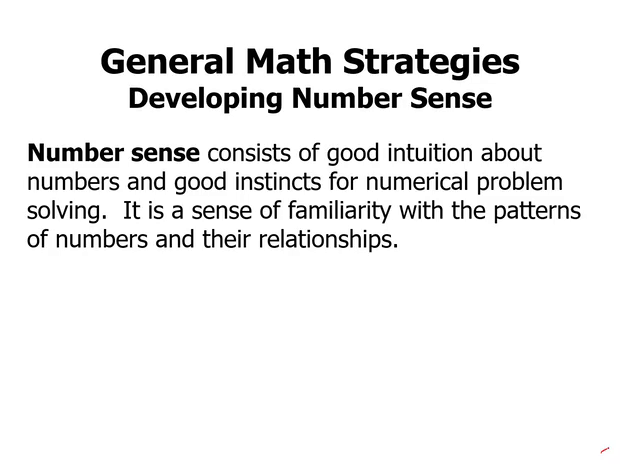 Number sense consists of good intuition about numbers and good instincts for patterns in problem solving. It's a sense of familiarity with the patterns of numbers and their relationships. Obviously, having good number sense would be a big help throughout the quantitative section, but what if somebody doesn't have it, how do you get it? So first of all, consider some of the previous strategy lessons, dividing by five, doubling and halving, squaring shortcuts. The highly specific recommendations of those were, as it were, distilled insights from number sense. In other words, we at Magoosh, we have number sense, and we picked up these patterns and said, look, here's a useful pattern, dividing by five, doubling and halving. We showed you these patterns very explicitly. In those lessons, you were essentially handed a few useful patterns. Number sense is about seeing more patterns on your own. The folks with good number sense tend to be the ones who love math. Especially the people who in addition to all the required math also learn more on their own, and maybe even do recreational math. Now, the idea of doing math for fun that would be completely absurd for some people, but believe it or not, there are people in the world who do some math just for fun. Now the irony is that good number sense would be most helpful for the folks who don't like math, who avoided it and never did anything more than they absolutely had to. They would only do math if they're forced to do so at gunpoint. But of course avoiding math does not enhance number sense. And so, the behaviors of the people who don't like math are unfortunately precisely those which are least likely to develop number sense. Unfortunately, there are not really rules for number sense, it's an intuitive sense about the patterns of numbers. It can't really be communicated explicitly. In other words, there's no possible way that we could just list every pattern that exists in mathematics. Developing this intuition requires experience, and part of this involves a kind of open-minded curiosity about the patterns of numbers. And that's really important, and especially for people who never liked math, see if you can at least get to that point of open-minded curiosity. What are some of the cool patterns here? As you move through the math lessons, you'll learn about some individual patterns. We'll point out a few more patterns when we're talking about integer properties or algebra or something like that. Get curious about those patterns, explore them a little more with calculator or on paper. In other words, do a little more math than you have to, and see if you can notice some more patterns on your own. When you do a problem and read solutions, get curious about what if questions. What if this or that aspect of the problem were different? How would that difference change the problem? Understand that sometimes changing a problem, for example making a particular number bigger or smaller, might make the problem unsolvable, but that's also an important thing to understand. Why is a problem this way solvable, but when we make this one change, it becomes unsolvable? In many ways, curiosity about numbers and their patterns is the way into number sense. For example, what patterns do the multiples of seven follow? And what is similar or different about the patterns of the multiples of 17, or 27, 37, any other number that ends in 7. What's the connection, say, between the patterns of the same multiples of two numbers that have a sum of ten? Such as the multiples of three compared to the multiples of seven, the multiples of four compared to the multiples of six, something like that. I'll also suggest one game you can play with numbers. I realize that if you're not fond of math, the idea of a game might sound unusual, but it's only by frequent exposure to numbers, and even playing with them, that you will develop intuition for these patterns. So it's a very simple game, step one, you're gonna pick four single digit numbers at random. You might roll a die four times, you might pick four cards from a deck of cards, until you have four single digit numbers. Then you're gonna use those four numbers in any combination. You can use addition, subtraction, multiplication, division, exponents, parentheses, you can use them, each number, once and only once to produce all the numbers from 1 to 20. So suppose you're just given this starting set, 2, 3, 4, 5 and that turns out to be an incredibly convenient starting set to have. If you're just beginning, don't worry about getting all the numbers from 1 to 20, just see how many different ways you can combine those four numbers and what the results are. What are the different ways that we can combine four numbers?. For example, we can certainly add all four of them together, all right, that would result in 14. We could multiply them in pairs and then add them. So for example, 2 x 3 + 4 x 5, that's 6 + 20, which is 26. We could pair them in a different way, (2x5) + (3x4) = 10 + 12 = 22. So those seem to wind up with relatively big values. We could also just multiply a single pair and then add the other two. So example, (2x3) + 4 + 5, that's 6 + 9, which is 15. We could also pair 2 and 4, (2x4) + 3 + 5, that's 8 and 8, which is 16. We could also fool around with exponents. So for example, 2 to the 3, which is 8 + 4 + 5 = 17, or 3 squared + 4 + 5 = 18. Notice that in the course of these calculations, we've already gotten numbers 14, 15, 16, 17 and 18. So we've gotten some of the numbers in a row already. We could subtract in pairs. For example, we could subtract 3- 2, which is 1, 5- 4, which is 1, and then just add those, 1 + 1 = 2. Or instead of adding them, we could change that addition to a multiplication, that is 1 times 1, which is 1. We could pair them a different way, 5- 2 is 3, plus 4- 3, which is 1, 3 + 1 = 4. Or instead of adding those two pairs, we could multiply them. And so these are some ways that we get the numbers 1, 2, 3, and 4. So we're starting to get different combinations by doing it. And of course there are many, many more ways to combine the numbers. So at first you can just explore, see how many different ways you can get. See how many different numerical results you can get from combining them in different ways. And if you stumble onto more than one way to produce the same numerical result, that's also wonderful. If you're more ambitious, then you could be more systematic and try and get all the numbers from 1 to 20. Below this lesson, there's actually a link to a PDF where I show how to get all the numbers from 1 to 20 with this set and with a much harder set. Here's a practice problem, pause the video and then we'll talk about this. So this is kind of an algebra problem, and we'll see a lot more of this when we get to the algebra section. But I'll say here that part of number problem is just noticing patterns. So there are a few different patterns to notice here. So notice first of all, 6N times whatever is in parentheses, that's gonna be divisible by 6, so it must be an even number. Right away we can eliminate all the odd number answers, okay? Now, notice that if we take this expression, that's our equation, notice that we have an N factored out in this expression here. And so what we're gonna do is factor out an N in this equation down here. So we factor out, and we get N(20N + 7) = 201. Well, that's starting to look a lot like the thing that we wanna find the value of. In fact, all we have to do is multiply both sides by 6, then we get 6N(20N + 7). Well, that has to equal 6 x 201, that's not bad, 6 x 201 = 6 (200 + 1). Well, 6 x 200 is 1200, 6 x 1 is 6, 1200 + 6 = 1206. Of course if number sense is something new to you, that approach might seem slow and hard and inefficient. And it's sort of like riding a bike. If you've never ridden a bike before, then the first day that you ride a bike, you're gonna be falling off, you're not gonna go very fast. But of course as we all know, once you get good at riding a bike, you're gonna be able to go much faster than walking. And much in the same way, you have to get used to number sense. At first, it will be slow and plodding, you'll make mistakes, but over time you'll get incredibly efficient. Curiosity and a sense of play are the best states of mind for noticing details and picking up patterns. That's in mathematics, in fact, that's in general. If you can cultivate these attitudes, they will help you notice the patterns and interconnections that go into number sense.